Details: The first part of that Hyperion Enterprise tutorial contains posts and FAQ's which help understand the idea which stands behind Hyperion and its way of operation. There are around 50 questions with answers which may serve as a good preparation for a Hyperion interview. 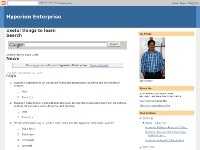 In the next sections users learn how to use the Hyperion Enterprise Web Client, Hyperion Retrieve (Excel or Lotus 1-2-3 add-in for Hyperion Enterprise), Currency conversion tables in Hyperion and much more.